This is a smaller version of our best-selling Steco Transport handlebar mount rack. It connects in exactly the same way, between the handlebars and the forks, giving great flexibility with regards to the size of an object that can be carried on the front of your bike. However, the load bed of this version of the rack measures 20 cm wide by 20 cm front to back. Some people prefer this rack as they find it looks less cumbersome. The load capacity in terms of weight is the same for both racks. A flat area in the centre of the handlebars 13 cm wide is required for fitting. 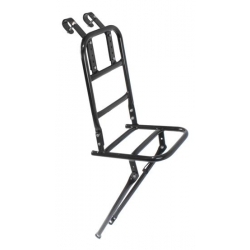 The attachment to the handlebars is adjustable for height and can be set between 30 cm and 43 cm from the flat bed of the rack. Photos in "additional images" show this. This rack is smaller, but is still intended for an adult bicycle. We also have a version of this rack sized for childrens' bicycles. Note that this rack will definitely not work on a bicycle with front suspension as while the distance between the front wheel centre and handlebars can be varied a lot at installation to fit most bikes, it must not change as you ride along. Also note that for safe installation you need to have wheels with wheel nuts. This rack is not designed to be used with quick release wheels. Recommended accessories with this rack are a steering damper and a double kick stand. For well over 80 years, Steco have produced a wide range of very strong bicycle racks used by generations of Dutch people to carry a wide range of cargo and people. this very conservative company rates this rack as having a capacity of 15 kg.